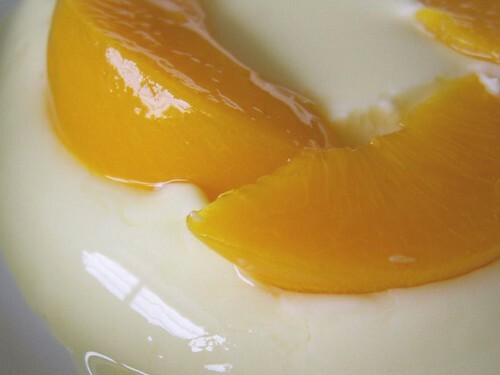 Canned peaches make beautiful subjects for photography. And what do I do with them after taking the pics? Turning them into nice, delicious dessert, of course. A tip on buying canned peaches. 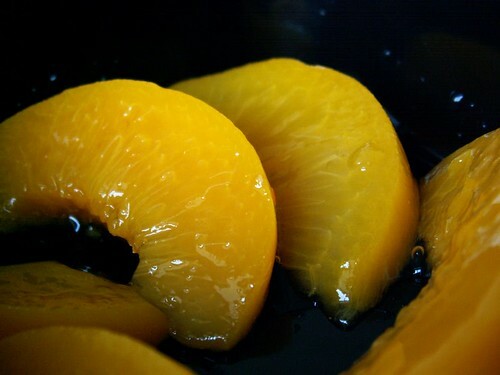 Spend a little bit more on California peaches because they are firmed and the fruits are larger. China brands are much cheaper but they tend to be too sweet (as in more sugar content). 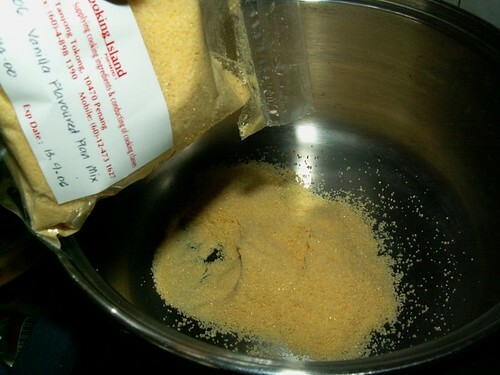 I bought this packet of vanilla flan mix from Cooking Island for RM4. Boil it over low fire with one liter of full cream UHT milk till you get one or two bubbles. Turn off heat. Before that, line your moulds with peaches or any kind of fruits you want. Caramel would be nice but I wasn’t sure how to do it. 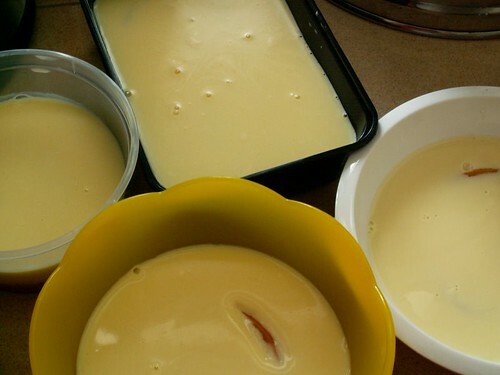 Pour the vanilla/milk flan mix into the moulds and leave to cool. Store them in the refrigerator to cool. I am very pleased with the result. 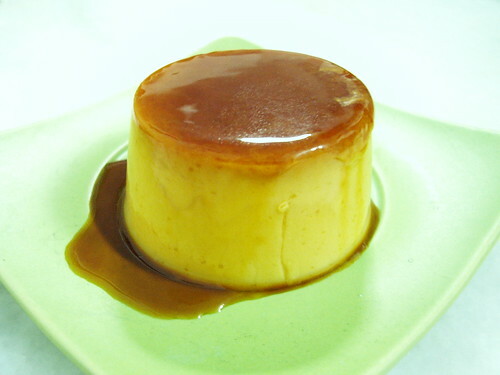 I had tried a few brands of custard pudding before and I must say that the flan mix is really easy to make. It firms and hardens rather nicely without being mushy. Yet, it is still very smooth and doesn’t taste too sweet or has overpowering vanilla flavours (which I can’t stand). What better way than to get kids to take milk than this? (some older children don’t like milk and this is a nice way to get them to take it) Erina of Cooking Island told me one can mix the flan with instant coffee for a coffee flavoured flan. I may try that next time. Caramel is basically sugar and water that is cooked over a slow fire until the clear liquid turns light brown. Very tempting indeed. I tried to shop at Jusco and Carrefour for alternatives for flan mix since I am in KL. Can you suggest what I can use. I have got the peach can and milk all ready 🙂 Thx ! Ann, if you can’t find flan around your area. 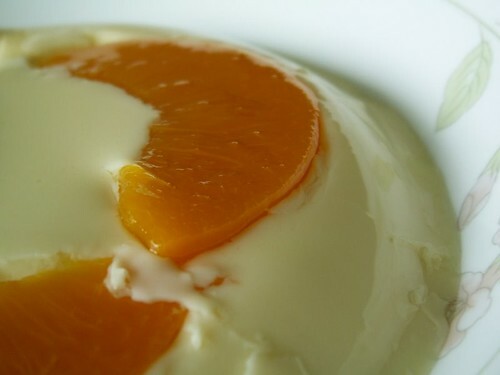 You can also cook milk with some jelly powder but for this you must add sugar alright – coz it’s not a mix. When it’s ready, you can pour it on the mould. Let it cool and set. Then, you can place the peaches on top. Chill then seved.